Wouldn't you just love a Le Creuset Cake Stand? ...and just look at these deep rich colors! They key to appetizing treats is always in the presentation. No matter how long you've taken to make your baked goodies or no matter how simple the recipe, a beautiful presentation helps enhance it. That's why it doesn't matter if you're using simple to make recipes as long as it is tasty and delicious and always displayed with elegance. 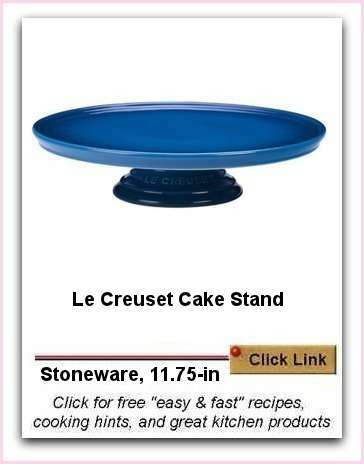 Why a Le Creuset Cake Stand? I love the Le Creuset stoneware and the sturdy exterior enamel as it means it won't be damaged by knives. Display, slice and serve from this beautiful cake stand without worrying about chips and knife cut damage. Always, always, always get out your best tableware just like this cake stand to display your creations. Food tastes so much better when displayed and presented with thought. As we all know, Le Creuset products are not just beautifully designed, they are sturdy, durable and last for decades. I see them as an investment. The size is nearly 12 inches in diameter and it fits cake baked in standard sized pans. Size : 11.75 x 3-in. Select a cake stand to match the color theme of your home, or select a classic design like this one. 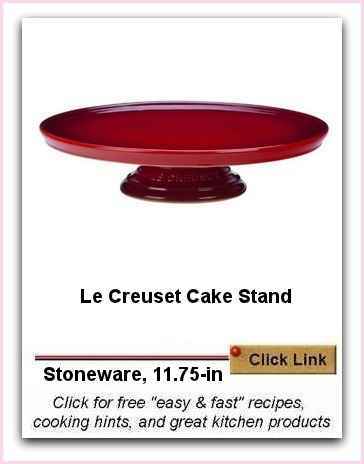 Order the Cherry Red Stoneware Cake Stand!